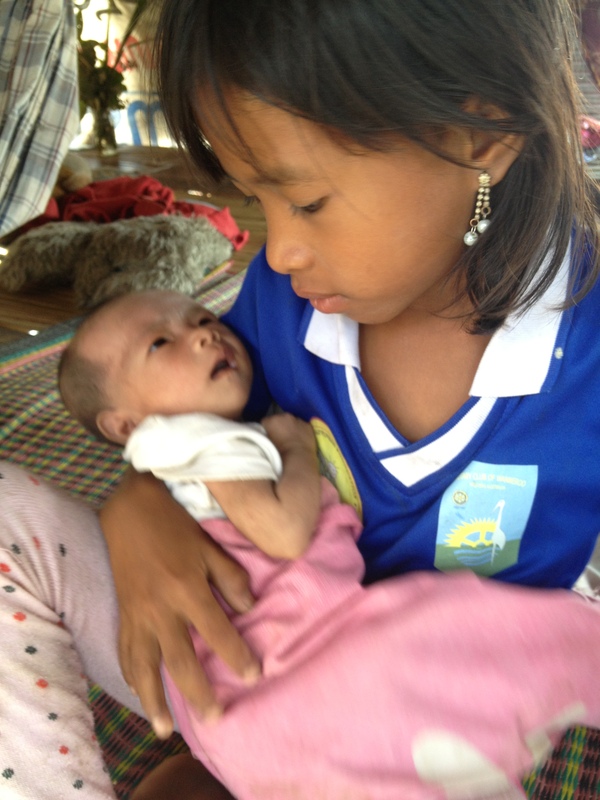 After visiting Mae Sot and meeting Fred and the Eyes to Burma community in 2012, Megan came back to Australia with a new perspective, having been both moved and motivated by what she had experienced. Her passion to help touched me so much so that I too had to make the journey to see first-hand the work that is being done in Mae Sot to make the lives of those displaced by the issues in Burma just that little bit better. This is our story. 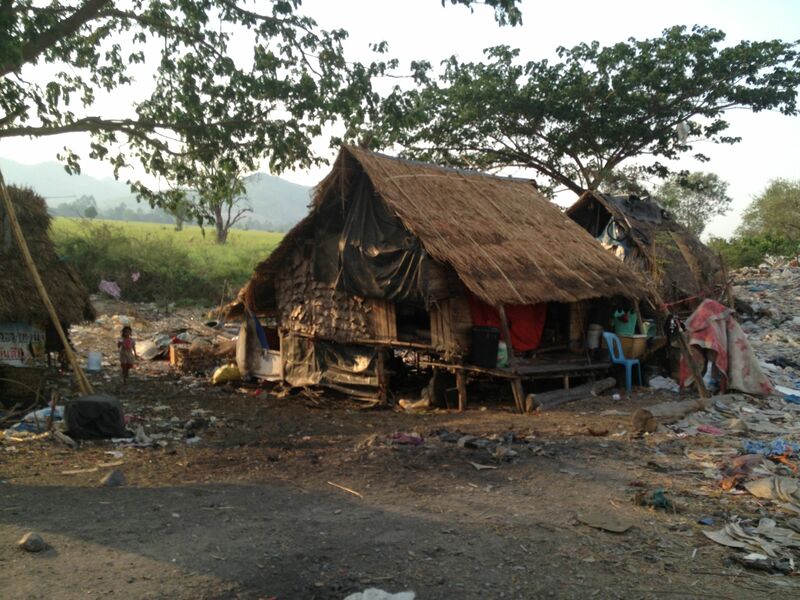 Our timing was probably not perfect in terms of the Thai New Year celebrations, but travelling to the Mae Sot dump during Songkran to meet Fred, Komyo (Fred’s interpreter) and the Burmese families who live there was very much worth it in our eyes. Songkran is a happy time in Thailand, and the families living on the dump were all in good spirits when we arrived: the children laughing and playing, with traditional paint on their faces, throwing water from the dam on everyone and anyone coming by, and shrieking in delight when they managed to saturate you; the adults smiling and welcoming, interested in meeting the newcomers. It is such a surreal experience. On one hand you can see the sheer poverty that these families live in on a daily basis; and on the other hand, you witness the sheer joy of this special time of year and the embracing nature of these families – you almost immediately feel a part of this community. Songkran is a time of giving and sharing in Thailand and we were privileged to be a part of this event – even if it involved being completely soaked from head to toe for a few days! During Songkran, we were treated to music, dancing (a very interesting version of Gangnam Style, but in Burmese!) and offerings of food that had been prepared for all the community to share. You cannot help but smile and adopt the enthusiasm and excitement during this time, but in the back of our minds we knew that this isn’t life on a daily basis, and once Songkran was over the real life challenges would again emerge. Songkran finished a few days after our arrival and, even before the rainy season approaches in a few weeks, the colder weather moves in and it gets harder to pick through the garbage, stay dry, and keep warm. We noticed that temperaments started to change as people resumed their everyday lives. You get the impression however that no matter how difficult it gets, the resilience of the people living here will win through, especially knowing that they have Fred and Eyes to Burma to support them. Our first meeting with Fred was enlightening. He strikes you as someone who genuinely cares about other people, someone who has faced many challenges (there have been and will continue to be many more), but someone who has stood tall throughout these challenges as he looks for ways around them – whatever it takes. It’s hard to imagine the physical and mental drain that can, at times, take over his life, but the reward is in the genuine love and respect that this community has for him and the knowledge that each and every day, little by little, the lives of these families are improving. It’s a long, hard road, but the changes that have occurred, not only to the conditions that the families are living in, but to the mindset of the community as a whole, makes you realise that although the journey might be difficult, the end result will be worth it. Fred is a bit of an enigma: someone who willingly shares aspects of his past and present life, but maintains an air of mysteriousness about him. It’s not often you come across someone so passionate, so driven with such purpose, and so focused on improving the quality of someone else’s life, possibly to the detriment of his own comfort, that you cannot help but ingest some of this passion and watch, almost in awe, as he juggles the multitude of challenges that come his way. Our discussions with Fred left us both with our heads spinning somewhat. 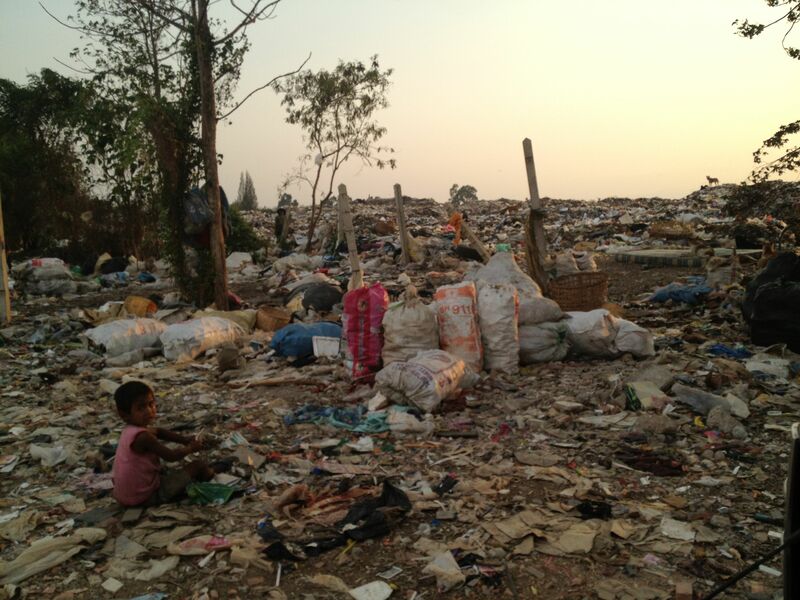 There are just so many elements to what Fred and Eyes to Burma deal with every day – and they’re not all limited to the challenges faced by the Burmese community living on the Mae Sot dump. Scratch the surface and you’ll find a culture just like any other, permeated with simmering tensions, boredom, personality clashes and politics. Just because these families have come from a life of persecution and conflict doesn’t make them immune to the social issues that face all of us in our everyday life. Pour this into the melting pot with basic necessities such as clean water, food, shelter and healthcare and you soon understand just how challenging a role Fred, Komyo and Eyes to Burma have in Mae Sot. Our short time at the dump found a number of issues coming to the forefront; one of the main ones being malnutrition of newborn babies. The hardest thing to grasp in 2013 is that children can be born into this world and not have access to the basics – even something as simple as breast milk. We cannot imagine how difficult it must be for mothers who are not able to easily breastfeed their children, and who are not able to easily communicate that they are having problems, but it does happen. It was heartbreaking for us to see a three and a half month old baby suffering from malnutrition because her mother was struggling to feed her. The baby looked like a newborn and the clothes that we brought over (for newborns) were way too big for her. Thankfully, with the provision of baby formula from recently donated money, this baby is now on the road to recovery and, hopefully, a better future. One of the other priorities well underway when we arrived was the construction of housing and new roofing to houses that had been damaged or ruined over time – all of which needed to be completed prior to the rainy season. One particular home started to lean quite seriously whilst we were on the site one day and by the next morning it had completely slid down the hill – a terrifying experience for the family living in it at the time we’re sure. It didn’t take long however for Fred to arrange for a group of the men living on-site to commence work on re-building the home so that this family wasn’t without shelter for too long. Once again though, something we tend to take for granted in a western culture is something that isn’t taken for granted here – these homes can be damaged, destroyed or need to be moved quickly and this community just takes it all in their stride and gets on with the job. This is where funding is so very important, and although many people may not get the opportunity to see first hand how their donations are being used, we can assure you that they are used to ensure issues such as malnutrition don’t become prevalent in this community, and that a basic such as shelter is available to everyone. Other affirmative actions resulting from donations include the provision of 5 tanks around the different areas of the dump that supply clean drinking water to all of the community. These tanks are a lifeline and ensure that the families living here do not have to resort to drinking the toxic dam water that surrounds the dump. Access to clean water should be a human right, but one that hasn’t been regularly available to this community until Eyes to Burma came along, and you can definitely see the positive results of having such a necessity. A combined community centre and tea shop has also been constructed in the past year from funds raised, and it was truly heartwarming to see so many families (especially women and children) congregate here to play, chat and socialise. This is also the only place at the dump that has a television – so you can imagine that a show that is popular guarantees a crowd – and provides for a relaxed atmosphere – and some welcome light relief from the punishing schedule of picking through garbage every day just to survive. A small ‘clinic’ has been established on the site too and Fred spends time at this clinic nearly every day ensuring that minor wounds, illnesses and health problems are quickly dealt with or, if need be, directed to the main clinic in Mae Sot. Simple things such as dehydration (the heat is unrelenting at times), cuts and abrasions, and aches and pains are easily taken care of, but it’s with the more serious issues that you quickly realise Fred’s skills – and his ability to identify and arrange for treatment of major health concerns before they become too far gone. Fred is now looking to construct a youth centre, start an educational programme, improve access to healthcare (and diminish preventable diseases) and, hopefully, create more employment opportunities. All of these are imperative if this community is going to continue to move forward, but it will take more funding to achieve. The aim being to encourage the children growing up this community to want to change their own lives and, ultimately, the lives of their own children. These children have the opportunity to gain life skills, an education and, hopefully, the will to want something better. From Megan’s perspective, having visited Mae Sot last year, the improvements have been significant and far reaching, and to see for ourselves the difference from one year to the next not only gives you a sense of purpose, but inspires you to continue to help in any way possible. 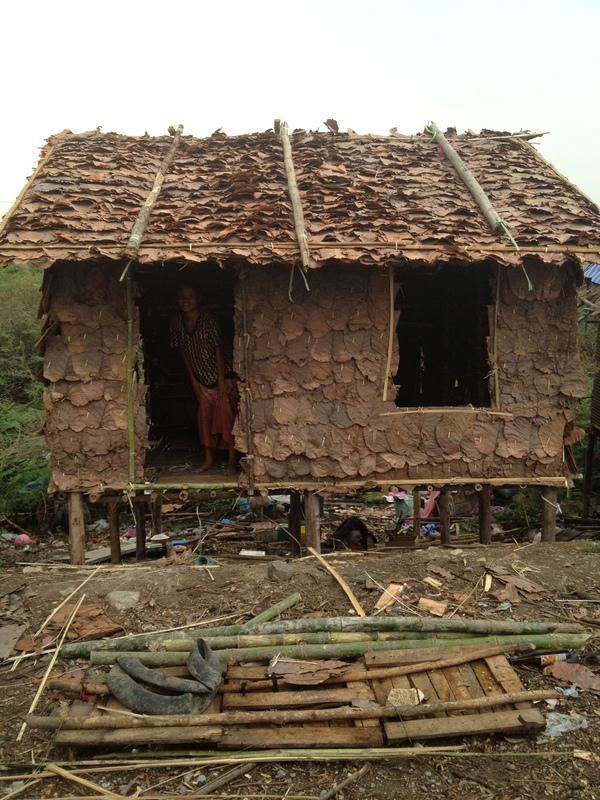 The work that Fred and Eyes to Burma are doing in Mae Sot can only be described as vital. They are striving to create a better future for everyone, but this will be a generational change. Eyes to Burma are making huge in-roads, but in small steps, and, progressively, this community is learning how to take responsibility, how to work together and, hopefully down the track, how to be more self-sustainable. Fred is creating opportunity, building self-respect and encouraging those that wish to develop skills that may help them in the future to do so. He does not receive any monetary benefit from any donation and the Eyes to Burma team are volunteers, so every single dollar is used wholly and solely to benefit the community as a whole. As outsiders, we can see how it would be very easy to say to Fred, just do it this way, or just do it that way and the problem will be solved, but unless you actually visit Mae Sot, meet Fred, meet the community and really get to know the challenges they face, in no way can you fully understand what will work and what won’t. Fred has spent years on this project, and he has overcome many of the issues. He now finds himself in the ‘enviable’ position whereby he can work through many of the problems with the community without too many difficulties, but this isn’t something that was achieved overnight and certainly not from a distance. This visit has been a humbling experience for us, and we have learnt so much in such a short space of time. There is a long road ahead and, although many improvements have been made from the donations received, there is still so much more to do. We would like to sincerely thank Fred and Komyo for their time and sharing their knowledge and insights, and we look forward to coming back to Mae Sot and working with them in whatever way we can assist.